Ask leaders at big companies what worries them, and one of the first things they’ll mention is the challenge of managing a workforce at a time of rapid change. Jobs being transformed by automation and artificial intelligence is one big concern—even if the full effects are still a few years off. Even now, with automation just starting, many positions require new digital capabilities or deep technical expertise. They’re hard to fill. And then there’s the impact of demographics. Older employees are retiring, and younger replacements don’t have equivalent knowledge. If younger people want to take on these legacy jobs—a question in the first place—it’s only on certain terms. Younger candidates bring their own workplace expectations. As they wrestle with these challenges—and the resulting talent imbalances—corporate leaders and economic policymakers should be taking a closer look at where people want to work, what they want in a job, and where to find needed skills. Just as companies and countries study everything from the capital markets to the weather, they must now try to get a handle on the future of the workforce. This includes finding foreign candidates at a time when immigration policy is undergoing change in many countries. In taking this comprehensive approach—and by comparing our findings with those of our previous study in 2014—we set out to understand what has changed about people’s job preferences and attitudes toward mobility. BCG and The Network conducted this survey in the first four months of 2018. All told, 366,139 employees and job seekers, in 197 countries, participated. The 40-question survey elicited workers’ attitudes in a variety of areas, including their willingness to work abroad, the countries and cities (other than their own) that they would most like to work in, and what they value in a job. The survey also asked about the time that people spend on training, about their willingness to retrain for a new job, and about the impact on their own jobs that people expect from digitization and globalization. The survey also gathered demographic information, making it possible to analyze respondents’ attitudes along a variety of parameters, including nationality, age, education level, and level of hierarchy in an organization. A slightly different version of the survey, aimed at uncovering employer views and challenges, was taken by almost 6,200 recruiters and enabled some “mirror” analyses. In some instances, comparisons between 2018 and 2014 were difficult because of changes in survey execution (changes were made to better fit mobile platforms). For that reason, we have avoided most direct percentage comparisons between the two years. Where we have made such a comparison—such as between overall willingness to move abroad now versus in 2014—we have done so only after reanalyzing the 2014 data using a weighting factor. In addition to the online survey, BCG conducted follow-up interviews with 33 workers. The individuals we interviewed represented a cross-section of the global workforce by age, country of origin, profession, and education level. Understanding global workforce attitudes is critical for both companies and countries. Those that manage it will gain flexibility in addressing their future challenges and will have the best shot at sustaining economic growth. There is no denying the impact that tightening trade and immigration policies are having on the US’s reputation as a work destination and that Brexit is having on the UK’s. The changes brought about by heightened nationalism show up in the survey results—sometimes subtly, sometimes less so. Other factors, too, have affected the global map of mobility. Notable among these are Europe’s refugee crisis, Asia’s continuing rise, and Eastern Europe’s economic revitalization. The net result is that overall willingness to emigrate has dipped. Fifty-seven percent of all respondents now say they would move to another country for work. While that is still a sizable number, it is 7 percentage points lower than when we asked the same question in 2014. Then, the “would relocate” response was 64%. It could be that the world is becoming less mobile. Or it could be that work itself is becoming more global, making it unnecessary for people to uproot their lives to find satisfying, well-paying jobs. Mobility is not lower everywhere, of course. More than 90% of Indians and 70% of Brazilians now say they would be willing to move to another country for the right job. (See Exhibit 3.) Those are two of the world’s most populous nations; in both, willingness to work abroad is up significantly since 2014. Willingness to work abroad has also increased substantially in the US and UK, the two countries whose political shifts have gotten the most attention, and is above 70% in much of Africa. Fifty-seven percent of people would work abroad, a drop from 2014. Among the countries whose workforce is significantly less inclined to consider a foreign work assignment now is China. Eric Li, an IT executive in Shanghai who participated in this year’s survey, says that China has become an innovator in many areas. That has made it unnecessary for Chinese to move abroad to advance their careers, says Li, who previously worked in both the US and the UK. “There are lots of really great opportunities in China over the next few years,” Li, 43, says. Improving economic conditions would also seem to explain the steep falloff in mobility in many central and eastern European countries. Respondents in Poland, Croatia, Slovenia, and Romania are all below the mobility average after having been above it, by wide margins, in 2014. This part of the world has seen a lot of investment and most economies here are growing at rates above the global average. Personal factors also play into mobility. People who don’t have children are more likely than people who do to say they would be willing to consider an opportunity in a country other than their own (60% of nonparents are willing versus 52% of parents). Similarly, there is more willingness to work abroad among those who are single than among those who are married (65% versus 51%), among men than women (61% versus 53%), and among respondents in their twenties than among respondents age 60 or older (61% willingness versus 44% willingness). Because the survey respondents skew a little young, and because many describe themselves as job seekers (increasing their inclination to be flexible), the 57% willingness figure may overstate the interest in overseas employment among the world’s total work population. Willingness to take a job abroad is 67% among digital experts—higher than the world average. But often it’s younger employees—with their malleability, up-to-the-minute technical know-how, ambition, and stamina—that foreign countries and multinational companies want to hire in the first place. The survey contains potentially good news for the many recruiters who are responsible for filling technology or digital-development jobs. Sixty-seven percent of global respondents and job seekers who are expert in areas like user interface design, mobile app development, and artificial intelligence or machine learning say they would be willing to move to a new country for the right job. That’s 10 percentage points above the global average. By contrast, companies and countries may have challenges recruiting foreigners for less glamorous but still crucial blue-collar jobs. Countries need people to work in hotel housekeeping, take care of their elderly, repave the roads, and work the graveyard shift in manufacturing plants. But the workers who might be most inclined to consider these positions—those in service-sector or manual jobs with no more than secondary educations—rank relatively low in mobility. Just 50% of them are willing to move abroad for work, 7 percentage points below the global average. The reasons why people would be open to living abroad have shifted somewhat since 2014. Four years ago, the top reason was to broaden one’s personal experience. Personal experience still matters in 2018, but two more practical motivations—better career opportunities and a better standard of living—have risen in importance. Demonstrating its continuing appeal, the US ranked first as a work destination in the survey, as it did in 2014. (See Exhibit 5.) The US’s popularity isn’t limited to respondents in any one part of the world. It is the top destination for people in Latin America, the Caribbean, and sub-Saharan Africa; the second-most-popular destination for people in the Middle East and North Africa; the second-most-popular destination also for Europeans; and the third-most-popular destination for respondents in South Asia. To be sure, there are some specific countries in which the US isn’t viewed as favorably as it was a few years ago, before the 2016 elections. One clear example of the changed view is Mexico, the US’s southern neighbor, along whose border US president Trump has proposed to build a protective wall. That plan, and the rhetoric that has accompanied it, may have lessened the interest of Mexicans in moving to the US. First as a destination for Mexican respondents in 2014, the US is now second, after Canada. Before Brexit, the UK was the top European destination for foreigners. Germany has replaced it and is now the second-most-popular work destination overall, the survey shows. Germany exerts a particularly strong pull on respondents in Russia and also in North Africa, the Middle East, and Eastern Europe. (It has a somewhat lower appeal in many G20 countries—see Exhibit 6.) A variety of factors may account for Germany’s popularity, including the country’s strong industrial sector, generous social services, and open immigration policy. In 2015 alone, net migration to Germany exceeded 1 million people, driven by Middle Eastern and North African refugees. There are now more displaced Syrians living in Germany than in the rest of the EU combined. The third-most-popular work destination, Canada, has benefited from an immigration policy that is intended to strengthen Canada’s economy—and that most Canadians support. If you are between the ages of 20 and 29, well educated, have skills that the country needs, and can speak one of the two official Canadian languages (French or English), Canada wants you. And you may want it given Canada’s high standard of living, universal health care, abundance of nature and wildlife, and acceptance of multiculturalism. New to the list of top-five destinations this year is Australia. Australia appears to have taken on some of the shine previously associated with the UK. The interest in Australia as a possible work destination is particularly high in countries with which Australia shares a colonial past. This includes the UK itself, whose mobile respondents rank Australia first. Two other former UK colonies, India and South Africa, put Australia second. Interest in moving to the UK has declined dramatically since 2014. There is still a lot of interest from job seekers in common-wealth countries, a group that includes 53 independent nations and has a combined population of 2.4 billion people. For instance, the UK is still high on the lists of Jamaicans, Barbadians, Ghanaians, and Nigerians. But Brexit—with its protectionism and internal orientation—seems to have knocked the UK off the short list of would-be mobile respondents in other places. To take just one example, in 2014 the UK was the number-one destination for Chinese workers interested in working abroad. Now, the UK is number seven for the Chinese, behind Australia, the US, and four other countries including Japan. Tomilola Abiodun had already been working for six years in financial consulting and banking in her native Nigeria when she decided to pursue an MBA in the US. Abiodun believes that studying in the US will broaden her experience, allowing her to meet people from different backgrounds and countries. “It will advance my career,” the 26-year-old says. Like anyone who tries to reestablish themselves in a foreign country, Abiodun has encountered a bit of a learning curve. She didn’t anticipate how important networking—simply getting out and meeting prospective employers—would be in the US. “People do get great jobs, but they work very hard to get these jobs,” she says. The UK may have fallen in popularity as a work destination since 2014. But the snub does not extend to London. When people are asked about the cities they would work in, they tend to mention the big metropolises of the EU and the US. 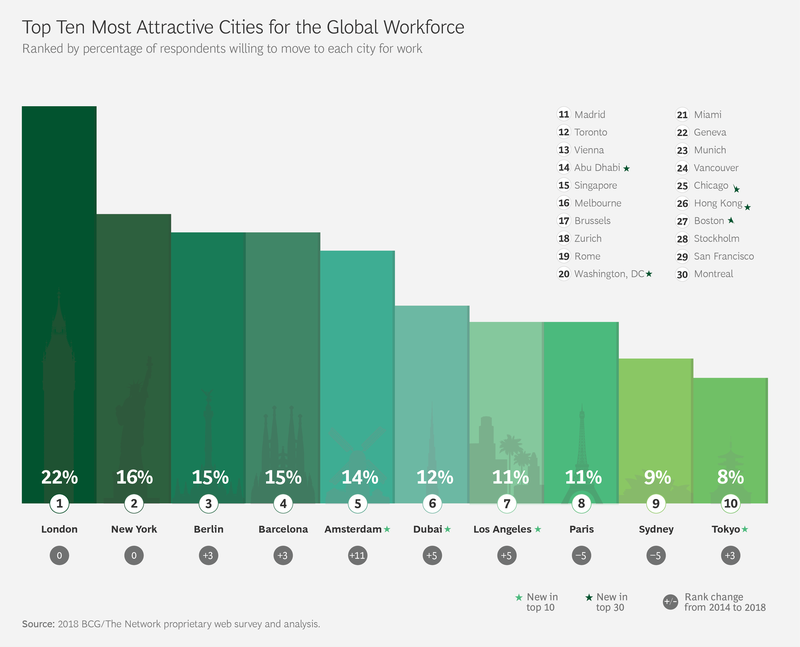 These two geographies are home to two-thirds of the most popular 30 cities for work from foreigners’ perspectives. But cities in other regions are starting to attract attention. Dubai (the most populous city in the United Arab Emirates) is now a top-ten work destination, according to our survey, and Abu Dhabi has moved sharply up the rankings too. Hong Kong is another non-Western city whose popularity increased in the last four years. Another European country whose relative popularity as a work destination has fallen, likely as a result of policy changes, is Switzerland (now number eight on the list of all survey respondents). In 2014, voters in Switzerland narrowly approved a referendum limiting “mass immigration” and reducing the number of quotas available to foreigners. The new quotas have the most impact outside the EU, and this is reflected in the lower ranking of Switzerland as a work destination now versus in 2014 on the part of Russians, Chinese, and Americans. But the interest in working in this polyglot country has also fallen in two of its EU neighbors, Germany and Italy. Jesus Alvarez Manzanilla of Mexico was coming off a brief, unsuccessful attempt to start a business when he began freelancing to make ends meet. Although a digital career wasn’t what he wanted—Manzanilla had gotten a master’s in food science in Germany and was hoping to work in sustainable agriculture—his knack for numbers and for marketing were skills he could quickly capitalize on. Before long, a digital travel startup in the Netherlands was supplying all the contract work he could handle. Today, that client is Manzanilla’s employer, and Manzanilla is living and working in Amsterdam as a search engine marketer. He is one of millions of highly skilled digital experts around the world who have capitalized on their talents to nail down a great job and earn a good living. Manzanilla, 31, has a very high level of job satisfaction. He has an excellent rapport with his coworkers—“I feel I can talk with everyone”—and abundant opportunities for skills development. He is now learning Tableau, a visualization technology, and SQL. Respondents globally tend to put a premium on the job benefits and satisfactions that are a function of an employer’s culture. The top three job preferences cited in the survey are a good relationship with peers, a good work-life balance, and a good relationship with one’s superior. The top job priorities have to do with relationships and work-life balance. The top workplace satisfaction factors, which also ranked high in 2014, all have to do with the feelings that people have about what they do every day. That is also true of appreciation for one’s work: the gratification one feels when one’s ideas, approaches to problem solving, or project management skills are singled out for praise by colleagues or a boss. Getting such recognition is a primary goal of German workers and ranks high in other parts of the world as well. “It’s important to get credit,” says Ana-Maria Simionovici, a Romanian computer scientist who has a PhD from the University of Luxembourg and has been a researcher at the University of Sydney. And let’s not forget compensation. A desire not to seem too blatantly mercenary may have kept the number of “votes” for this job element low in the survey. But money does matter. And respondents in some countries aren’t reluctant to say so. To those in Russia and Ukraine—where market economies are barely a generation old—financial compensation is the most important thing. The survey also shows that people’s job preferences evolve over time. Most people’s concern about money, for instance, increases in their thirties and peaks in their forties and fifties, the period when they may be raising a family and have the most financial obligations. And job preferences are also affected by personal circumstances that vary from person to person. When we interviewed Sudha Lakshmi of New Delhi four years ago, her primary concern about her job in operations at an Indian insurance company was economic. “My priorities have changed,” Lakshmi, who has a teenage son, says today. “I am getting paid well” by the same company she was at previously and “that gives me a good work-life balance. Now my priority is to do something that helps my son in his studies or that will enhance his career in the future.” That includes giving her son the opportunity to study and live abroad, as she herself did last year, when she worked in London. To be sure they have the right mix of talent, companies should take the following steps. Rigorously forecast their workforce and skill needs. It all begins with strategic workforce planning—forming a picture of where a company may have fewer skills than it needs in the future and where it may have too many. A crucial new input here will be staff changes resulting from automation, once robotic software and artificial intelligence come into wider use. Be creative and flexible in sourcing. One of the big opportunities in an interconnected world is the ability to access needed skills even when the skills don’t exist, in the required quantity, at home. Technology companies have been particularly forward-thinking about this, bringing difficult-to-fill jobs to where the experts are, rather than asking the experts to come to where they are. Apple and Google are among the many international technology companies that have opened R&D facilities in the digital-talent “hot spot” of Tel Aviv. A lot of other such hot spots are emerging, including Abu Dhabi, Barcelona, and Hyderabad, India. We expect to see more companies, including companies from traditional industries, establishing outposts in these locations. Companies should also consider investing in innovative recruitment solutions, including the use of algorithms to identify promising candidates on job and social media sites, as well as video interviews that apply artificial intelligence to identify the best prospective employees based on speech patterns. Products like these can make the recruitment process more global and efficient—though they might best be seen as a support tool for recruiters, given candidates’ focus on company culture and on a more personal touch in their office relationships. Some companies, when they can’t find a specific type of employee, acquire a whole set of them at once. The move (in the form of a buyout done to gain access to human expertise, not to any underlying assets) is called acqui-hiring and it has become especially common as a way to pick up digital talent. Usually, the acquired company abandons the products or services it was working on and the employees move to projects that are priorities for the acquirer. Remake the culture to fit the preferences of the workforce. For companies that want to get the best workers, saying the right things isn’t enough. Instead, companies must genuinely rethink their cultures and encourage the behaviors that will make a difference to those who work for them—now and in the future. New behaviors won’t start until employers change the organizational context that drives behaviors. This means adjusting the goals, resources, and constraints that shape how managers and employees work and interact. Among the things that can push this forward are modern performance management systems, including real-time direct feedback from colleagues; shared targets that encourage collaboration; and new organizational models, like agile teams. Agile methodologies may be particularly valuable when applied broadly across companies. Implementing agile on this kind of scale flattens organization structures and requires more collaborative relationships, including at the boss-employee level. It can contribute to the work atmosphere identified as important in the survey. The Slovakia where Matej Hrapko got his master’s in applied mechanics was struggling economically. “There weren’t that many opportunities, and salaries were low,” he says. So, Hrapko set out for Western Europe, getting his doctorate in the Netherlands and working in a succession of high-level engineering jobs in Switzerland and Germany. Hrapko says his next step might be to manage other engineers—helping them to reach their own potential—rather than continuing to tackle and solve technical problems himself. He is also looking to find ways to spend more time with his wife and two children—a preference for work-life balance that many people feel as they approach 40. Take steps to reskill and develop the workforce. A logical outgrowth of the strategic workforce plan, staff development of this kind involves the use of quantitative models to determine which employees should get new or additional training. It also includes the implementation of new ways of learning (like app-based digital “nudges”) and of new career paths and profiles (such as a digital-expert career track). In many countries, there is tremendous pressure to curtail immigration and inbound mobility. No one can say for sure how long this pressure will last. It’s our view, though, that mobility and open borders allow highly skilled talent to flow freely, which is crucial for the development of economies in the long run. For that reason, countries should undertake the following initiatives. It’s no surprise to Scott Fagerstrom that China is showing up as a work option for more people—he made the jump himself just about a year ago. Until 2008, Fagerstrom held a succession of increasingly higher-level editorial positions at US newspapers and in corporate and agency public relations. But he was laid off when tech giants began siphoning off revenue from newspapers and PR agencies, forcing those industries to cut jobs. For a time he worked at local and online news outlets, getting downsized out of those positions as well as jobs in the communications sector disappeared. At one point he checked groceries at a big-box store, a position he accepted because it offered health insurance. Last year, Fagerstrom, 62, got a lifeline: a one-year contract as an editor on an English-language newspaper 9,000 miles away in Beijing. Fagerstrom is one of a handful of editors there who are native English speakers, a crucial skill at a paper where virtually the entire reporting staff is Chinese and knows English only as a second language. Though Fagerstrom says his Chinese is extremely limited—“I can count from one to five and say please and thank you”—he would consider renewing his contract to stay in China or finding another gig elsewhere in East Asia where his knowledge of English would be valuable. That China is showing up as a work option for more non-Chinese seems like a logical development to him. China has jobs, he says, and “people are attracted” to that. Develop a strategic workforce plan. This means making quantitative forecasts for how national talent and skill gaps will evolve in the future. Without such a starting point, countries won’t have a clear picture of what’s happening with labor flows and won’t be able to intervene in their own economies in effective ways. Put forward a national “brand,” where possible, to support specific inbound mobility initiatives. There are numerous examples, large and small, of countries addressing their skill shortages by targeting foreign labor. Finland’s recruitment of Filipinos to serve as nurse assistants for its elderly population is one example. In Canada, the restructuring of the country’s Temporary Foreign Worker Program is bringing in unskilled and semiskilled labor for jobs that Canadians don’t want. Forge a retention strategy. Countries’ workforce plans will highlight which segments of the labor market are most important to their future. These most important workers must be given a reason to stay—or to come home if they have already left. China’s decades-old “sea turtles” initiative, in which the country is trying to get foreign-educated Chinese, many of them with technical backgrounds, to return home, is one example of a retention strategy. Another is Hungary’s attempt to curtail its brain drain by paying young émigrés to return. It seems reasonable, in the end, to wonder what all the changes mean for those now in or about to enter the workforce. For individuals, the best advice is probably not to bet everything on one skill. Indeed, workers should understand that skills that once seemed like a guarantee of lifetime employment can lose their relevance quickly. The logical response, especially to the risk of displacement through technology, is learning new skills—an adjustment that most workers are already thinking about. Sixty-eight percent of respondents say they are willing to do some retraining today, even without any immediate job risk. Another 29% say they’ll retrain if they have serious problems finding a job. Indeed, training is already woven into the fabric of the modern work experience. Two-thirds of all workers spend a few weeks to a few months per year learning new skills or processes, the survey shows. An increasing amount of this occurs through self-study. Dina Kiseleva, a Russian national now living in Germany and working part-time as an actress, says she has taken several massive open online courses (MOOCs) and finds them very helpful. “It’s a wonderful way to gain some knowledge,” Kiseleva, 41, says. Just as it’s smart, from a skills perspective, not to put all of your eggs in one basket, it’s also smart, for those who are mobile, to have more than one possible destination in mind. If the last few years have demonstrated anything, it’s that places that once seemed full of potential can be diminished by regulatory or political change.